Oliver Cromwell (1599-1658), Lord Protector of England. Sitter associated with 224 portraits. Samuel Cooper (1609-1672), Miniature painter. Artist associated with 111 portraits, Sitter in 4 portraits. 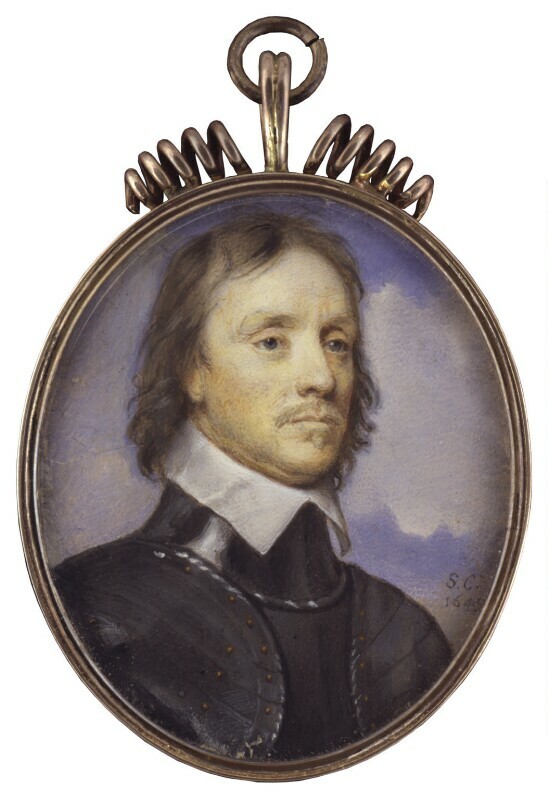 Samuel Cooper, the miniaturist who was described by the Grand Duke of Tuscany as 'a tiny man, all wit and courtesy', produced this fine portrait of Oliver Cromwell in 1649, the year of Charles I's execution. Cromwell at the time was in the process of becoming the effective leader of the Parliamentarian forces and is depicted looking callous and determined but not yet disfigured by the pimples and warts that were the distinguishing features of later portraits of him. Charged with subverting the nation's laws and liberties and cruelly making war against Parliament and the English people, Charles I is found guilty by a court of 159 commissioners, and beheaded outside the Banqueting House, Whitehall. England is declared a commonwealth and power is entrusted to a Council of State. Eikon Basilike, a self-exonerating account of Charles I's rule, is published days after his death. Allegedly written by the king himself, John Gauden, Bishop of Worcester, claimed authorship after the Restoration. Other tributes followed the king's death giving rise to a royalist cult of Charles the Martyr. Oliver Cromwell, as lord lieutenant of Ireland, begins his campaign in Ireland to subdue royalist support, and leads English Parliamentarian forces against the Royalist-Confederate coalition. The campaign's bloody massacres, in particular, the Siege of Drogheda and Wexford where Cromwell's troops slaughtered soldiers and civilians alike, became notorious.